Regular readers of the Weekly Report will know that I often stress the importance of “The Big Idea” and talk about how thinking “Big” can lead to success. You know I believe that #BoldBrandsWin, but this week, I was reminded that Hall of Fame basketball coach John Wooden was right, “It’s the little things that are vital. Little things make big things happen.” In other words, all of your Big plans can come crashing down if someone fails to focus on something small. Take Chipotle for example. The company has spent the last 20 years developing a great brand that has been adored by millions… and made billions. (Chipotle’s IPO was priced at $22/share to start and surged to almost $750/share.) And while the company was focused on its brand, and growth and being the biggest, they forgot about the little things… like putting pork in the refrigerator. Their e-coli scare last fall cost them $8 billion in market share. No matter who you are, or what you do, it’s good to focus on the little things. 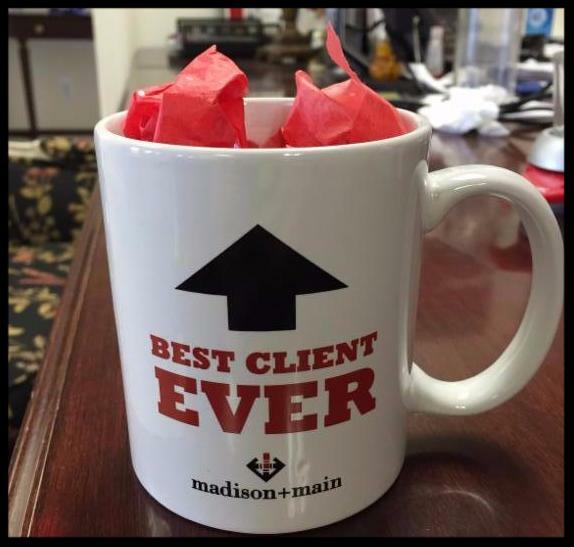 We had a busy week at Madison+Main, and we changed our focus just a little bit. Thanks to CBS6 Interactive Media Director Scott Wise for setting up a great segment on the Super Bowl ads! Tuesday, February 9th – We’ve been spending a lot of time in Hampton Roads recently, so we dropped by to see our friends at the Dragas Companies and we met with Rachel and Pagewho work for a wonderful organization that helps fight homelessness, ForKids. We’re working with Dragas and ForKids to help them make their Art Auction on April 9th a big success. To learn more about the event, click here! On Tuesday night I had a proud papa moment as I watched my daughter Hattie perform her solo for “Touch of Swing,”Manchester High School’s award-winning show choir. She practices every day and she is an inspiration to me because I know that she focuses on the little things, and that is one of the reasons for her success. At the end of her performance, Sue and I jumped to our feet to give a standing ovation. I looked around and discovered we weren’t alone… the entire auditorium did as well. Click here for a sneak peek. Wednesday, February 10th – On Wednesday, the Main-iacs had a very productive meeting for our new website. Some of you may recall our website is only 2 years old, but in these fast-paced digital days that’s a long time. By the way, how old is your website? If it’s more than 3 years old, maybe you should call us. 804-521-4141. Keeping with this week’s theme, “the little things” do matter, especially in content marketing. Many times business owners ask us “What should we say in our blog? What kinds of things should we post onFacebook?” My answer is; the little things. If John celebrates his 5th anniversary with the company today, take a picture of him and congratulate him on Facebook. If the company ordered lunch and everyone sat around the table to eat it, take a picture, tag the restaurant and post it on Instagram. If a client of yours is having a birthday, send them a simple greeting through LinkedIn. Content is all around you, every day and everywhere, and all you have to do is look to the little things for inspiration. Thursday, February 11th – I do find that little things are important. Little things like checking my calendar. I had an early morning breakfast meeting with my friend Donnie Harper from Door-to-Door Solutions and thank goodness I checked my calendar, or else I would have been late for breakfast again. I picked up the tab Thursday because I was more than 40 minutes late for my last meeting with him. Donnie is a great friend, and we had a great discussion about life, business, the economy and how Perly’s serves the best corned beef hash anywhere. Later that day I forgot to check my calendar and drove to Midlothian for the Chesterfield Chamber Luncheon at the Sheraton with Kaitlin. There was only one problem, they didn’t have a luncheon Thursday. #oops The hole in my calendar presented another opportunity for me to expand Kaitlin’s culinary horizons. I drove her to Chicken Fiesta and she was impressed-ta. It was amazing. So this little chicken rotisserie restaurant has been in business for 7 years, has 3 locations and I’ve never heard of it… how can this be?? It’s a jammed-packed-Friday, so far. We had a great meeting with our friend Alan Hutson from Monument Group and Debra Marlow, director of the Lucy Corr Foundation, this morning. Afterwards it was meetings, conference calls, presentations… it’s been a busy day. I was glad I could carve out a few minutes to tell you about it in the Weekly Report!